I have such found memories of sitting around the card table at big family gatherings that it’s almost unfathomable to consider that others from my generation (and earlier) never experienced the same joys. But sure enough, every so often I encounter someone who has never played any classic, traditional card games. They think “tricks” are pranks played in college. And you might as well be speaking Greek when trying to explain them, because terms like trump, ruff, kitty, stock, marriage, bower, revoke, slough, and “shoot the moon” and “going alone” all mean something very different to them, if anything at all! Today, it seems like those time-honored card games are getting rarer and rarer. So, if you’re looking to re-kindle an old flame and introduce these oldies-but-goodies to your friends and family, here’s our guide to the mechanic that comprises the vast majority of traditional card games and how it has infiltrated the modern hobby. Trick-Taking: How Does it Work? Okay, so you’ve probably gathered that the concept in trick-taking games is taking tricks! Just what the heck’s a trick? A trick is a group of cards played in one round by all players – one per person. A trick is captured by the player who plays the highest card according to that particular game’s rules, which varies. And, boy, does it vary! The winner of a trick usually leads to, or begins, the next trick. Trick-taking games are classified by several sub-genres. First, they can be either plain trick-taking or point trick-taking games. In plain trick-taking games, the goal is to simply capture tricks. Whist is a perfect example of this style as a partnership is trying to win more tricks then the other team. Point trick-taking games are different, however, in that the goal is to capture certain cards that are worth points. In these examples, there may be one or several tricks that are actually worthless because none of the point-producing cards are present within them. One of the more accessible titles in this style is the classic game Pitch and its family of diverse variants. A second distinction of trick-taking is the presence of trump. Indeed the word has become almost synonymous with the mechanic. Trump is the suit in a game or hand which beats all other suits, regardless of which was played first. Within the trump suit itself, tricks are won by the highest trump played according to its ranking. Some games, like Spades, identify trump for every game. In the majority of cases, however, trump changes from hand to hand as determined by random draw or player declaration. In non-trump games, tricks are captured by the highest card played of the suit which was lead to begin the trick. There are few surviving trick-taking games that do not have trump. Hearts is probably the most popularly known (unlike Spades, the name of this game does not indicated hearts as the trump suit). The obscure and ancient Piquet has survived among aficionados only, while Truc and Truco are popular entries in this category in some parts of Spain, France, and South America. To classify games with trump even further, many of them have specific rules regarding which suit you can play and when. There are a few titles with no restrictions in card play. Briscola and its variants, popular throughout the Mediterranean, fall into this group. Most others, though, require that you follow with a card of the same suit as was lead. If you don’t have a card of that suit, sometimes you can throw any card out while other games force you to play trump if you have it. Then there are a handful of games that require you to beat a previous trump, if able. Bidding is also a common element in many trick-taking games, although some do not have this aspect. In the games that do include it, bidding is done to either choose trump for a hand of play or to determine who leads to the first trick or often times both. Usually you are required to meet or exceed your bid by winning the declared amount of tricks or points. If you fail, you suffer a penalty. The ranking of cards can also be a distinction. Some games follow the familiar pattern where the ace is high, followed by the king, queen, jack, ten and on down to the deuce (2). Don’t always count on that, however. The Ace-Ten family, of which Pinochle is a member, ranks the ace and then the 10 as the two highest cards. Other games can have stranger rankings. In some games, such as those in the Jass group, the card rankings for the trump suit is different than that of the other three plain suits. And it’s not uncommon for specific cards to jump from a plain suit to count with the trump! A final, major distinction in the genre concerns the amount of tricks and/or points won. Obviously, there are multiple tricks in a hand, and most games will play out over several hands. Usually winning tricks is a good thing. The most common types are straight-forward, positivetrick-taking games, where the goal is to win the majority of tricks or points either alone or in conjunction with your partner. Bridge (plain trick-taking) and Pitch (point trick-taking) are favorite examples in this category. For more of a challenge, there is a class of exact bidding games which requires players or teams to declare a number of tricks or points and then earn that amount, suffering penalties for failing to do so. Oh Hell!, some variants of Whist, and the Spanish game La Podrida fit this category. In last-trick games, the sole objective is to win the final trick of the hand. These are not very common, especially in North America. Finally, there is the evasiontrick-taking group. Here, the seemingly counter-productive purpose is to avoid getting tricks or points. While also not as common, Hearts is the most familiar in North America, Ramsch and Laus are frequent in parts of Germany, while certain bids in the very popular Jass family will call for hands of this fashion. The classic games mentioned so far are played on traditional decks. Most Americans will be familiar with the 52-card French-suited pack of hearts, diamonds, spades, and clubs. Yet the beauty and fun of many classic trick-taking games are exploring other nationality decks. Italian cards are more common in packs of 40 with suits of cups, coins, clubs, and swords. Spanish decks use the same suits but with a standard size of 48 cards. 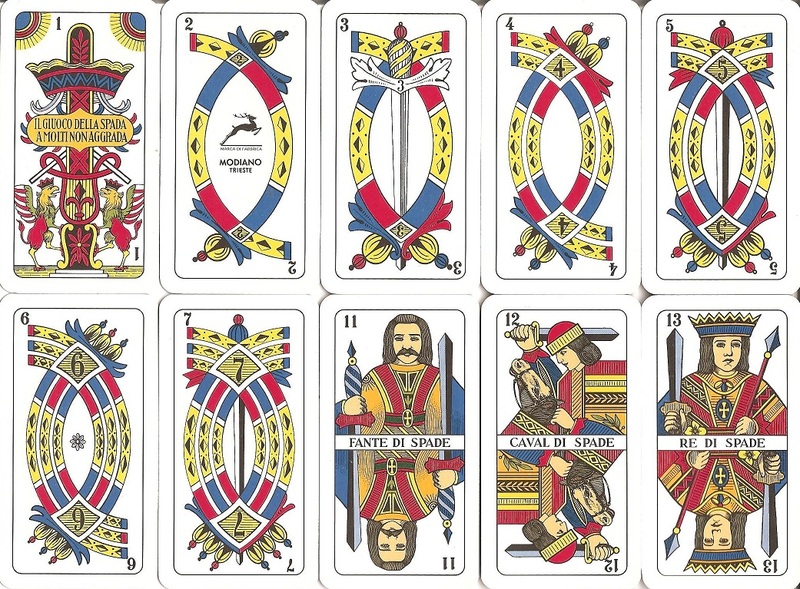 German decks comprise a variety of sizes, 32 and 36 are especially typical, depending on the game, with suits of hearts, acorns, bells, and leaves. Further still, Swiss-suited decks primarily come with 36 cards for the game Jass, and have shields, acorns, bells, and flowers. The suit of swords in my Triestine regional Italian suited deck for the trick-taking games Briscola, Tresette, and Madrasso. But in the last century, specially created commercial decks have imported the trick-taking mechanic into the modern hobby. These are decks made specifically for a new title. 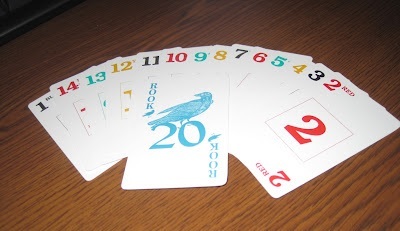 The first successful design was Rook (1906), a Parker Brothers game of point trick-taking with bidding and trumps, requiring players to follow suit. Plus it includes a special card, appropriately called “the Rook,” which you try to win and keep. There are many other commercial decks with a unique take on the classic trick-taking mechanics. Trumpet (1990) is a basic, plain trick game with a special score track that helps determine trump. Yin-Yang (2010 – reimplementation of Relationship Tightrope) is an evasion variation where you win tokens for playing high and low cards, but try to get rid of them by discarding a high/low pair. The critically-rated Mü (1999) includes bidding and a good deal more complex rules for broader depth. Other commercial decks in the modern hobby are very close clones of some traditional classics, or at least heavily influenced by them. Wizard (1984) is very much like the exact bidding game Oh Hell! Cosmic Eidex (1998) resembles Jass. 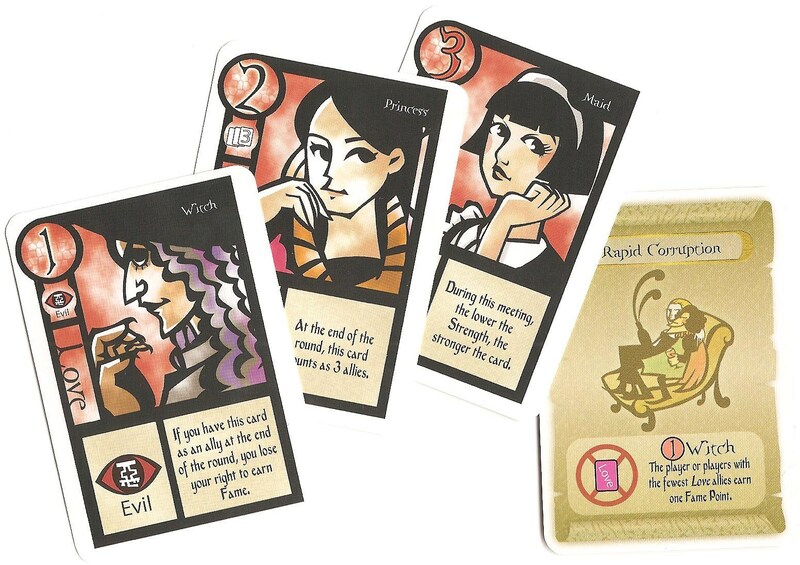 A Conclave of Wyrms (2010) uses a bidding system similar to Spades. And Little Devils (2012) will remind veterans of the evasion game Hearts. Other creative designs take the simple concept of trick-taking and then change its standard constructs – such as card rankings or trump – from hand to hand. Stich-Meister (2010) is a plain-trick game whose rules vary slightly each round. The Dwarf King (2011) is a non-trump title with varying contracts every hand as determined by a drawn tile; and it has special power cards. Those Pesky Garden Gnomes (2012) assigns players individual, unique goals which earn points depending on how they are fulfilled. Finally, not all of these card games are completely abstract. Many designers have incorporated some interesting themes that mesh well with the trick-taking mechanic. Canyon (1997) couples exact bidding with a race game – in this case, racing canoes down a river (essentially the score track). Kracków 1325 AD (2008) combines plain trick-taking with winning space on a game board for area control. And the interesting design Trick of the Rails (2011) takes the mechanic to the stock market and route building elements of the popular 18xx genre. You can even go to Middle Earth with The Hobbit Card Game (2012) where characters from the story impact how cards won in tricks are distributed to players and scored. Trick-taking is one of the older mechanics in the hobby. Long the realm of traditional card playing, the last century has seen the rise of commercially produced decks designed specifically for one game. And only in the last 25 years, or so, have titles really started to trick-out this genre with greater theme – and we’re happy to take it as it continues. Classic trick-taking games offer numerous benefits. Most are perfect for social and casual circumstances. They’re quick, relaxed, and easy to play anywhere since you just need table or floor space and a deck of cards. They can be perfect filler for those brief periods of downtime at conventions or in between plays at game nights. Many people have played one or a few of these games at some point in their life and so that familiarity makes it easier to teach them new titles or variants. Plus, a few exceptions notwithstanding, trick-taking card games are accessible to a wide age-range of ages so that they’re ideal for the family. One of the greatest attributes to trick-taking is the opportunity for partnership and/or team play, which is sorely lacking in modern board gaming. The partnership element brings so much more depth, nuance, and strategy to gaming. One, it generally enhances the social aspect of play. Honor is on the line as parents verse kids, couple takes on couple, or husbands square off against wives, and etc. Also, it can be fun and rewarding when you read your partner just right and develop a fine-tuned synergy as you hum like a well-tuned machine on your way to victory. In fact, this is a lifestyle for many regular card players! And some titles have a “call your partner” mechanic in which your teammate changes from hand to hand. All of the above is appealing to designers trying to port the mechanic to modern titles. Games that utilize basic trick-taking, but then add to or twist the concept, create fresh experiences which are still built upon familiarity and accessibility. These are made even more unique in that they’re played with a singular commercial deck, rather than standard cards, yet are not so foreign in look and purpose that they become a stumbling block. Indeed, these designs often elicit just the opposite reaction in introducing non-gamers to the possibilities, variety, and wonders of the modern hobby. Admittedly, there can be some complexity to trick-taking games. It’s not usually a major stumbling block to enjoying the genre in its basic forms. However, games like Jass and Pinochle, for example, do have fiddly bidding structures and include extra meld playing, but the trick-taking process is typically straight-forward. Then there are more multifaceted titles, but extremely popular, such as Bridge and Skat. These two examples have involved bidding processes and intricate card-play rules that seem convoluted to the uninitiated. On the other hand, the greater the complexity, the greater the opportunity for strategic depth. Two other perplexing aspects to the mechanic can be terminology and odd card rankings. The plethora of foreign words and insider labels associated to many of these titles can be confusing. Just the word ‘trick’ alone is unfamiliar to new gamers. This means that there is generally a learning curve with the deeper titles. Also, games that switch up card order will confuse those who are used to the traditional AKQJ1098765432 ranking. A final characteristic that may be a downer for some gamers is replayability. The cards are the same every game, dealt randomly, and the goals remain constant each play. There’s only so much you can do and the repetitiveness from session to session may bore some. It’s not always an issue for casual gamers who play mainly for the social aspect. For strategy gamers, one can ramp up the complexity, though that will then tend to distance casual fans. Chronicle’s cards change up basic trick-taking structure from hand to hand. Whist is the simplest and most accessible trick-taking game, in many ways the grandfather of the genre. I can’t say it enough, “Use this game to introduce the mechanic to new players!” After learning the basic, classic version, you can graduate to any of a dozen or more variations which add on more and more characteristics common throughout the genre. All Fours, and/or its American derivative Pitch, are the simplest members of the trick-taking family to introduce the bidding mechanic. Briscola is an excellent two-player title in the genre. It can also play with 3, 4, 5, or 6. It is a point trick game which does not require one to follow suit. While this strips some of the savvy play from trick-taking, it makes for another good option with which to introduce the mechanic to new players. Recommend playing on Italian cards. Rook was @FarmerLenny’s family card game growing up. In Rook, teams must bid how many points they think they can take in a round and then strive to meet their bid. There is a very valuable card – the Rook – that is very easy to lose, so players must be savvy. Trumpet is a simple trick-taking game with a score board for ease of play. Highly accessible, commercial design. Kraków 1325 AD might be an interesting choice for players looking for theme and other mechanics, in this case area control. Partners try to win tricks which allow them to place cubes in a sector of the city. And while the teammates earn the same points for these, they’re also working individually as the game is won by one person, not partners. To earn individual points, you try to get your secret suit to win a majority of the tricks. Chronicle is a trick-taking game with a twist – every card has a suit and rank, but each card also has an ability that can affect the trick when it is played. There are also goals revealed each round that affect which cards players are trying to collect (or avoid). The game can be somewhat chaotic, but it’s a blast to play. Here’s a brief timeline of titles using trick-taking. This is by no means a comprehensive list, merely a representation of some popular, unique and/or significant games utilizing the mechanic. What do you think about the trick-taking mechanic? Do you have other thoughts about its benefits or drawbacks? Perhaps you have a favorite title that’s not on our recommend list or the timeline? I’m currently working on a trick-taking game of my own, and it was fun to read this blog to see what’s all been done before. I’ll take some of that into consideration.